If you’re looking for a unique and expensive meal, try Osaka Yuku, Palermo’s Peruvian Japanese fusion restaurant. Yuku’s inventive chefs take traditional Peruvian ingredients and prepare them with Japanese methods. As expected, the results are delicious. 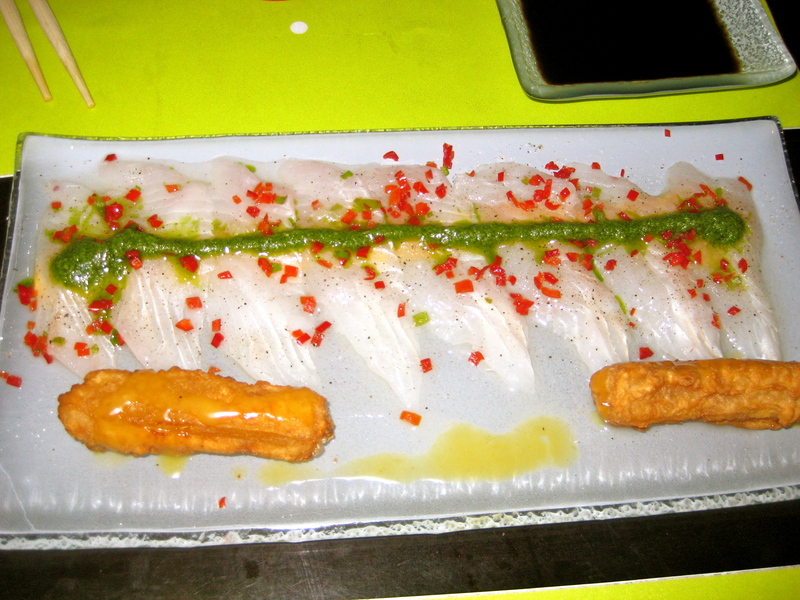 For an appetizer, Blair and I shared this tiradito ‘mi peru’ dish of very thinly sliced fish ‘cooked’ not with heat but with citrus and accompanied by a tempura sweet potato. My mouth was overwhelmed by the powerful flavors at play in this dish. Next we split kyuri cucumber salad, which is a personal favorite accompaniment to sushi. 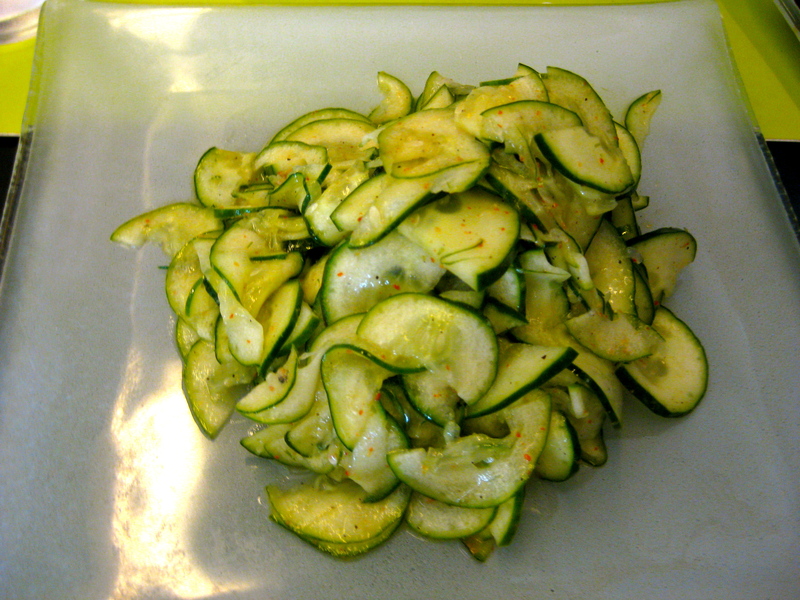 I love the tangy vinegar with the thinly sliced cucumbers. This dish caught me by surprise with it’s spice. We tried two half rolls of sushi, a spicy maki and a parma maki. 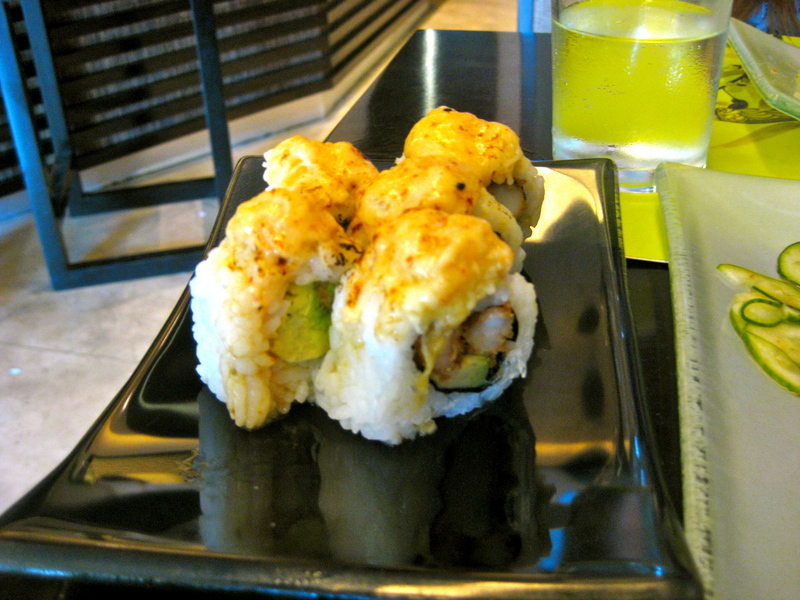 The parma maki was especially interesting, because it had parmesan cheese. 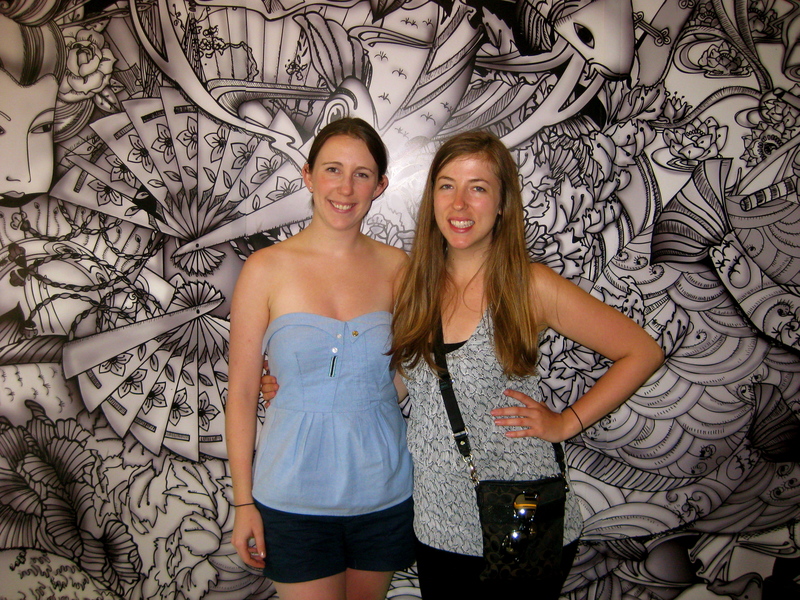 This tiny hot spot has great decor. The music is a bit too loud and unfortunately there is not much seating, although different seating options include booths, short stools and seats at the bar. 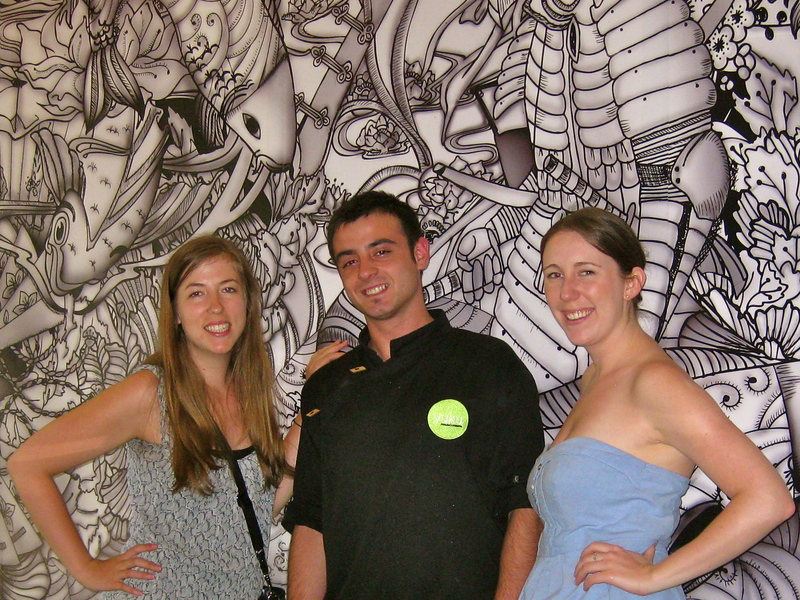 The service was very attentive and our waiter was always ready with recommendations. 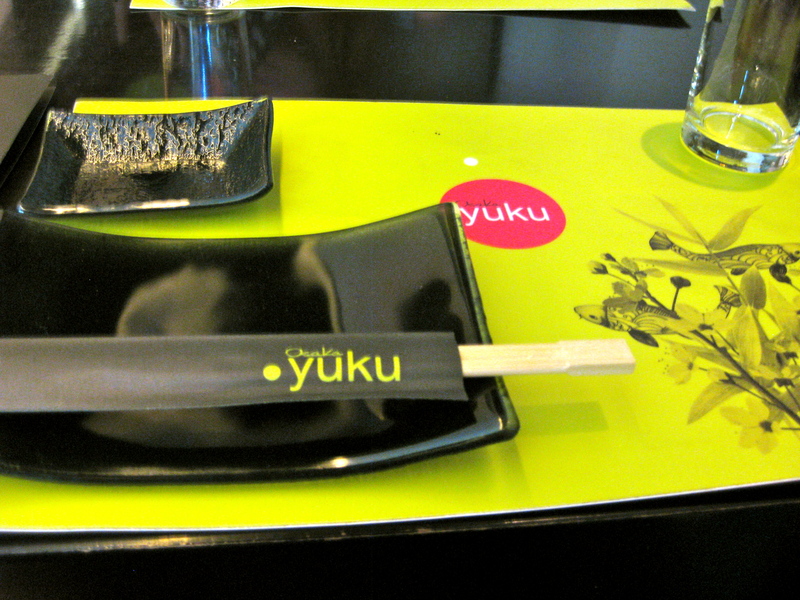 Osaka Yuku was a fabulous dining experience, and I’ll be saving up to go again! If you’re looking for more traditional or affordable sushi, try San Telmo Shokudo. Thanks for the crop job, much appreciated! Ooh, I keep being told to visit this place. Looks like an interesting introduction to Peruvian/Japanese fusion for a first timer like myself. How pricey are we talking? I ate lunch there today and as an American prices did catch me by surprise too, but once the food came, it was all worth it. Since the place is so tiny and unpretentious I would have never expected them to have such expensive sushi (I had two dishes that you had too). Definitely recommended. its a bummer that it is so pricey – but it is a nice special treat, and good sushi is hard to come by in BA – so I guess you have to pay for it! Glad you recommend, I haven’t been in a year. Might have to go back!